JASON SHANDLER TO BE THURSDAY'S GUEST ON BLOODHORSE.COM "TALKIN' HORSES"
LEXINGTON, Ky. - Join Jason Shandler, Blood-Horse staff writer and BloodHorse.com blogger, for this week's edition of BloodHorse.com "Talkin' Horses" at BloodHorse.com/TalkinHorses on Thursday, June 5, at noon EDT (9:00 a.m. PDT), sponsored by TrueNicks.com. With Big Brown having won both the Kentucky Derby (gr. I) and Preakness Stakes (gr. I), Shandler will discuss the horse's chances of becoming the first Triple Crown winner in 30 years. He will also help handicappers break down the race and give his opinions on the best way to make money on the race. Shandler has been writing for The Blood-Horse since 2004, initially covering the Triple Crown quests of Smarty Jones, Afleet Alex and Barbaro from Philadelphia, where he was born and raised. In 2007, he moved to Lexington and joined The Blood-Horse full-time. Specializing as a racing writer, he covers all the Thoroughbred action on a weekly basis. Shandler also hosts the "Triple Crown Talk" blog on BloodHorse.com, where he shares his thoughts about racing and interacts with readers. An avid bettor, he does not claim to be a "professional handicapper," as many so-called experts do, but has been known to hit a few big trifectas in his day and will often focus on finding longshots or value plays. Shandler was a correspondent and features writer for both NTRA.com and ESPN.com before joining The Blood-Horse. Questions for Jason Shandler can be submitted in advance now or during the online discussion by going to BloodHorse.com/TalkinHorses. The same Internet address will also carry BloodHorse.com "Talkin' Horses" webcast on Thursday. BloodHorse.com "Talkin' Horses" is sponsored by TrueNicks.com and offers an entertaining and engaging opportunity for racing enthusiasts to talk online one-on-one with high-profile insiders, newsmakers and legends of the Thoroughbred industry. Racing enthusiasts are invited to join in the discussion or simply enjoy and monitor the informative "Q&A" session as it occurs by visiting BloodHorse.com/TalkinHorses at noon EST on Thursday. Each edition of BloodHorse.com "Talkin' Horses" is archived online and available 24/7 for later reading. For more information, visit: BloodHorse.com/TalkinHorses. BloodHorse.com was voted the #1 horse industry Web site in 2007, 2005, and 2002 by the American Horse Publications Association, and was previously selected as a Top Seven Equestrian Web site by Forbes magazine. It is the preferred choice of industry professionals and racing enthusiasts alike for up-to-the-minute racing news and information. From award-winning, comprehensive editorial to fan-favorite Breeders' Cup and Triple Crown Mania channels and the engaging BloodHorse.com "Talkin' Horses" weekly feature, there is something for all Thoroughbred racing professionals and enthusiasts. BloodHorse.com is operated by Blood-Horse Publications, the Thoroughbred industry's foremost publishing company. Blood-Horse Publications also publishes The Blood-Horse, the leading weekly Thoroughbred racing and breeding news and information magazine; the award-winning The Horse: Your Guide To Equine Health Care, a monthly equine health care magazine; TBH MarketWatch, a newsletter for Thoroughbred investors and recipient of the prestigious Awards for Publication Excellence (APEX) for 2006 and 2005; the official Kentucky Derby and Breeders' Cup souvenir magazines; Auction Edge; and Keeneland magazine. In addition, Blood-Horse Publications also publishes equine-related books and videos under the Eclipse Press banner, and operates a family of award-winning Web sites including TheHorse.com, StallionRegister.com, ExclusivelyEquine.com, the official store of Blood-Horse Publications, BloodHorseNOW.com, and TrueNicks.com. To view up-to-the-minute news and information on your mobile Internet device , visit mobile.BloodHorse.com. To subscribe to any Blood-Horse Publications' publication, or for more information, call toll-free: 1-800-582-5604. 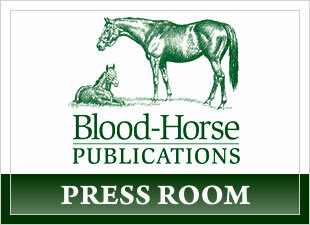 To view/download logos for any Blood-Horse Publications' brand, visit: BloodHorse.com/Pressroom/Logos.